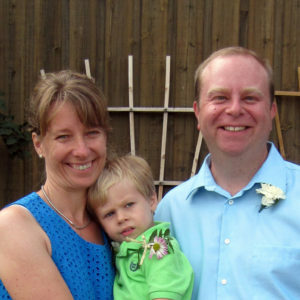 Stephen joined Mississauga Mennonite Fellowship as part-time pastor in September 2008. 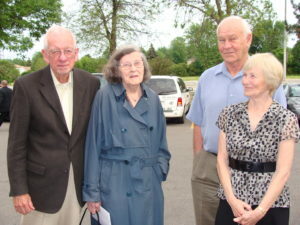 His wife Carol had spoken the previous spring at MMF representing The Dam which MMF supports. The search committee later called Carol and said “We like your husband. Would he come and be our pastor?” Stephen had to Google “Mennonites” before he could say yes! Stephen spent 10 years in IT as a Systems Analyst before leaving to finish his theology degree at Wycliffe College (Anglican), University of Toronto. He considers himself a denominational “mutt” having grown up in Nazarene, Presbyterian, and Congregational churches, marrying a Convention Baptist, attending Church of God, and Anglican churches, studying at an Anglican school and being ordained in the Church of Christ. But he has found a home with Mennonite/Anabaptist theology and it’s beautiful people. In 2008 Stephen also started “hanging out” in the local mall, getting to know the regulars there. Out of that he helped start Meadowvale Neighbours’ Café – a ministry to the community which MMF supports with Stephen’s time. We enjoy sharing our annual Thanksgiving and Christmas fellowship dinners with about 20 friends from the Meadowvale Neighbours’ Café each year. Stephen preaches twice a month seeking to hear the Bible, especially the life and teachings of Jesus as a guiding light to our daily lives and relationship with our loving Creator. Stephen and his wife Carol and their son Daniel live in Glen Williams (near Georgetown) on 4 acres where MMF enjoys annual picnics, bonfires, and hikes. We are quite a mixed bunch. Various ages, diverse cultural backgrounds, some born and bred Russian Mennonites, some who have adopted Mennonite/Anabaptist ideas. We are a small group – a fellowship – that tries to care for each other and support one another as we learn to follow Jesus together. We try to be inclusive, without judgement, of anyone who wishes to travel with us. providing a Mennonite/Anabaptist presence and peace witness in our community. Our worship services are very casual. Various people take turns leading the service, leading the singing, and speaking. We enjoy a sharing time in our service where anyone can share an inspirational thought, something they are celebrating or concerns they might have that we can pray about. 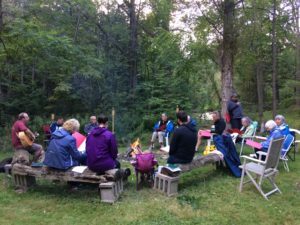 Throughout the year we enjoy getting together for hikes, picnics, workshops, selling borscht for MCC and potluck dinners.